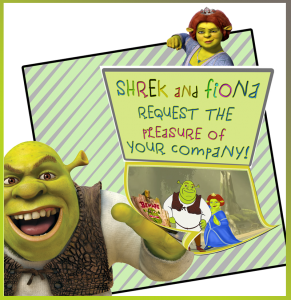 SHREK and PRINCESS FIONA request the pleasure of YOUR COMPANY! JOIN SHREK for SWAMP TEA from 1:00 – 2:30 PM on Sunday, July 8! ……And make your very own FREAK FLAG! Kids of all ages will love having their pictures taken with SHREK and FIONA – and, after all – who can pass up an opportunity to prove how NOT AFRAID of the BIG GREEN OGRE they really are?! 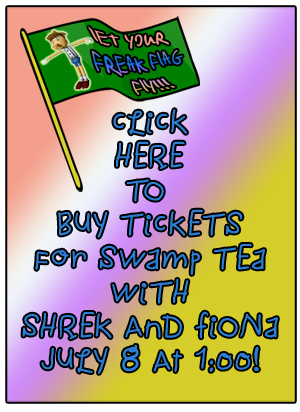 Tickets for SHREK THE MUSICAL, opening on July 27, 2018 at in The John and nancy Hughes Theater at The Gorton Community Center, will be on sale at SWAMP TEA with SHREK AND FIONA. Previous Post:MEMBERS ONLY SPECIAL TICKET OFFER! Next Post:CenterStage in Lake Forest’s ‘Shrek the Musical’ in Rehearsal!